cardigans and kids: fitting it all in. Fitting it all in isn't exactly happening. In fact, when I start to have a thought that just maybe that will happen, a few moments later reality strikes and I realize I just need to be content with what I do get accomplished. I broke these two onsies up over the course of a day. During my morning coffee, I cut out the stencils (after tracing onto freezer paper) and I ironed them on. Came back later to them to paint, and returned again later to remove the freezer paper and tidy up. 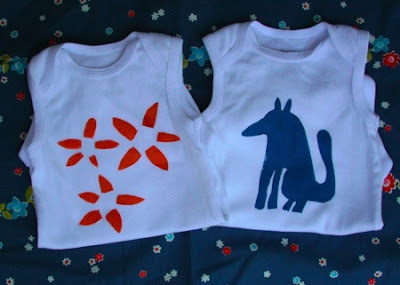 Stencils are from Lotta Jansdotter's book "Simple Sewing for Baby"